Interview with Gasgow Rangers, Milan and England legend Mark Hateley. 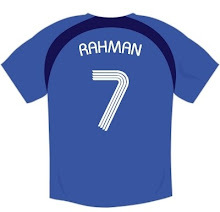 Emdad Rahman: I grew up excitedly watching Mark Hateley terrorise defences. The Englishman was a swashbuckling hero of a figure. After the exploits of Frank McAvennie at Celtic, it was high time that another striking hero emerged in Glasgow. Scottish football wasn't shown much on the box in England, but young fans like me kept abreast of all the action through Shoot magazine, Sportsnight, BBC Football Focus, Saint & Greavsie and Grandstand. There may be dark clouds gathered over Glasgow Rangers, but this is still very much a world renowned institution. We visited Ibrox to watch not only a game but also to spend some time being shown the ropes by this club legend. “It’s always a privilege coming here, as you can see very much for yourselves,” said Hateley. “It’s always a warm feeling. It’s always been that way. I supported this club as a young boy. I have had an association as a supporter since I was a kid. My Dad (Tony Hateley) played at Chelsea in 66 and there is a strong affiliation between the two teams. Big Derek Johnstone played for both Chelsea and Rangers. As a really young boy I knew a lot about this club even before I joined. And when you are a schoolboy and support a football club, you’re always going to be very, very close to that side of it, and if you get the opportunity as a professional footballer to come back and play for one of the clubs you supported as a kid then it’s a dream come true. “Every day when I walk through the front doors here it just makes me feel fantastic. I saw you sitting at reception taking it all in and I enjoyed watching that. It’s the sense of history here. Don’t forget the architect of Ibrox built the old Highbury, so there were always similarities in both the grounds as at Fratton Park, where I played with Portsmouth. “So, I seem to have had a connection with the architect of this great building throughout my career. But, as you say, you walk through the front door and the history just hits you straight away. Ibrox is such a fabulous place to be. 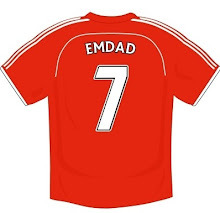 The circumstances of the football club over the last few years have been very difficult, but as an ambassador you keep going – albeit with a heavier, more sombre sort of feeling; especially when you've supported a club all your life and are surrounded by people who have come to watch the club play all throughout their lives. 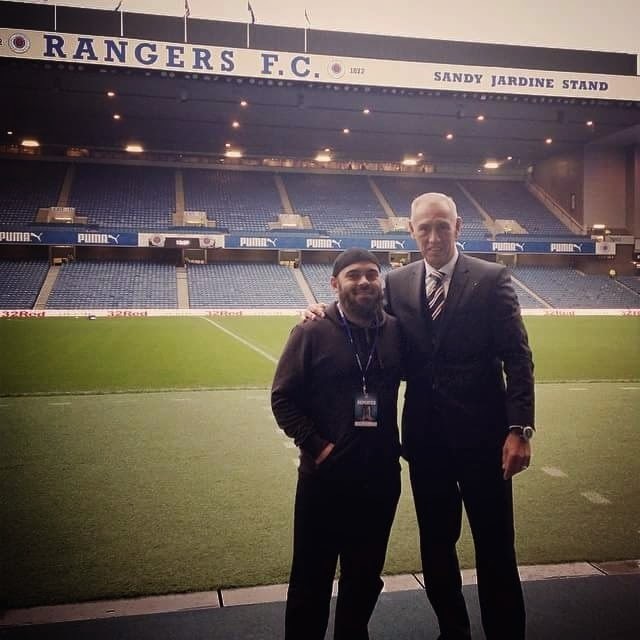 Rangers have an affinity and close relationships with Glasgow’s diverse communities and big Mark plays a major role in welcoming the world to Ibrox. “We host the Asian Cup here and we’re close to the people who run these high profile championships. There’s a lot of negativity surrounding Rangers but when we run our projects within the diverse communities they help to forge greater and stronger links. Just last week we had community workshops here and activities supporting Police initiatives in the community. Hateley joined Glasgow Rangers in 1995 after spending six years on the continent with AC Milan and Arsene Wenger at Monaco. In 1984 Hateley joined Italian giants AC Milan during a transition period in their history. He became a crowd favourite and was nicknamed Attila by the faithful. During the same year a young Hateley caused carnage on the continent as his goalscoring rampage led England under 21s to European Championship glory. It remains the last piece of silverware lifted by the national team at that level – and at any level until Robbie Fowler led England to victory at the 1993 European under-18 championships. “I was top scorer and we were unstoppable,” said Hateley, who was subsequently handed the UEFA Golden Player award which had been won by Rudi Voller two years earlier. On the south coast Hateley had scored 25 goals for Portsmouth and that coupled with his international purple patch led to a call up to Bobby Robson’s full England squad. Less than 20 days later Hateley was signed by Italian giants AC Milan. He recalls the fiery Milanese derby of 30 years ago. “My winner in the Milan derby has secured me life long hero status at the San Siro. Alessandro Altobelli put Inter ahead but we levelled through Agostino Di Bartolomei.” A cross by Pietro Virdis from the right was met full on by Hateley, who out-jumped former Milan star Fulvio Collovati to steer a bullet header past Walter Zenga into the Inter goal. It was Milan’s first derby win in ten attempts. “Magic! It was magic,” said Hateley. At Rangers Hateley became a cult hero. “There are a lot of golden memories but my favourite moment in a Rangers shirt would be probably the first season when I was here. It was the hardest for me because I’d had two years when I hadn’t played a game of football after numerous operations on my right ankle. I had come from Monaco, so it was a really hard season for me to get back my form, my strength, and my confidence. “We played Aberdeen in the last game of the season here and they needed only to draw here in 1990 to win the league. We’d just won two leagues back to back and it was the beginning of nine in a row. That day I scored two goals. I played against Alex McLeish and he made me look a great player that day, he really did. I scored one of my type of goals. It was a header from the edge of the box from a Mark Walters cross and it just flew in. You can’t speak to Mark Hateley and not speak about the famous John Barnes goal at the Maracana – conjured from an assist by the big man. “You mean the tap in,” he laughs out loud. “Did you know we were both born on the 7th of November? Both Scorpios. I’m three years older than John Barnes. I know it’s hard to believe he’s younger than me. I see John a lot because we work out with Al Jazeera Sport out in Doha and we talk a lot of football. That goal was 30 years ago. I helped make the first one for him. On my chest, laid it out and then boom… He went on that amazing mazy run. John Barnes scored one of the greatest goals ever seen. “Barnesey repaid the favour to me,” He grins again: “He put this horrible ball into the box and I nodded in. A typical header. Both our careers went into overdrive after that. “People always ask me what’s my favourite goal. Goals are all great for strikers. But you have goals throughout your career that become more important because they elevate you and the circumstances surrounding that goal against Brazil were incredible. “The week before that I had just played in the European under-21 final and won and scored against Spain. It was the last English team to do that at under-21 level. I scored six in the tournament, including four against the French in the semi final… as you do.” (We laugh together). “I got called up from the success of the under 21s and went straight into the squad and during the triangular tournament I got ten minutes against Russia at Wembley as my gift for doing so well, and also for doing well at Portsmouth where I scored 25 goals – 22 in the league that year. So it was a steady build up. Somebody got injured. One of the strikers got injured, so that meant that there was one more place in the squad left to go to South America. So I got dragged in. I got the arm around me and was asked if I’d like to come along. “I thought I would be pushing the skips and doing the teas and the coffees for the senior pros. I got there. I was in the right place at the right time. On the night before the game we had another injury and before you knew it I had the arm around the shoulder again and told I’m now playing. “So it was me and Tony Woodcock up front and if you look back you’ll realise that Tony Woodcock and I were one of England’s most successful pairings. We only played four or five times together but the ratio per goal, per appearance between us is good. “It was that set of circumstances, two players getting injured, that led to me getting to play the game. I grabbed it. That was a great England side as well. There were a lot of good players in Ray Wilkins and Bryan Robson – Mark Chamberlain, who’d already played a game I think. Barnesey had already played too. Hateley is hopeful that Rangers can gain promotion and take their place among the elite of Scottish football. “Our current season is touch and go. The performances haven’t been great. Our cup performances in the Scottish Cup so far have been great as we’ve beaten three Premier League teams. That’s what confuses the fans in that we can beat Premier League teams but struggle in the Petrofac Cup, like we did against Alloa. I think that’s the head scratcher for a lot of people. Alistair has had a pop at the players’ attitude, and rightly so. The manager takes a lot of flak and I think he has bought home a realisation of the standards expected of players at a club like Glasgow Rangers. Here you win every game, nothing else is acceptable. Performance levels have to be up there all the time. You can’t afford to drop off 25% of your game. You have to be at 95% or 100% all season. Every time we get played against, it’s a cup final.